NOTES: Gen 2 figure set with four figures. Blitzkrieg was a new form of mobile warfare that Germany unleashed on Europe, with rapid success gained in Poland in September 1939. The following year, in 1940, Germany used the same strategy against the Low Countries and France. In less than two months of rapid-moving armored warfare, the aforementioned countries had surrendered, and British forces had been ignominiously evacuated from the beaches of Dunkirk. Dragon’s latest Gen 2 figure set offers four German figures from this early period of WWII. 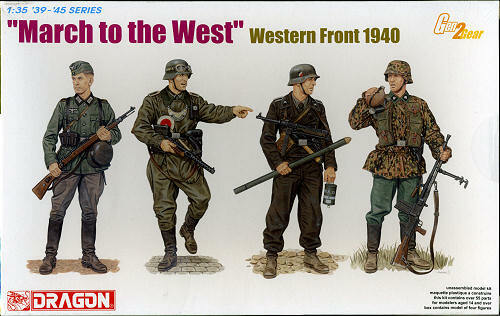 Entitled “March to the West”, the 1/35 scale set contains four German soldiers in typical gear at the time of this decisive campaign in May-June 1940. The four soldiers are all very different as they belong to various units. There is a Reiter (“cavalryman”), a Feldgendarmerie (military policeman), a Panzer-Pionier (combat engineer), and an SS-Oberschutze (“senior private”) from the famed Totenkopf Division. They are all wearing different uniform items in keeping with their functions. The Feldgendarmerie, for example, is wearing the rubberized protective coat issued to motorcycle riders. He also wears the MP gorget on a chain around his neck. Each figure is fully equipped with weapons made to the very latest Gen 2 standards. The range of weaponry includes MP28 and MP38 submachine guns, a Kar98k rifle and a captured Czech machine gun. To help him do his job, the Panzer-Pionier also has a Rohrladung Stahl 3kg (explosive charge similar to a “Bangalore torpedo”) and Nb.K.39 smoke canister. This is a versatile set that is sharply sculpted, and modelers will find multitudinous uses for it! Thanks to www.dragonmodelsusa.com for the preview kit and background information. Get yours today at your local retailer.